We go to the ragged ends of the earth to reach the most remote communities that have been devastated by disaster. We do this with the help of an amazing network of volunteers. Our emergency aid is hand-packed with care before being transported around the world. 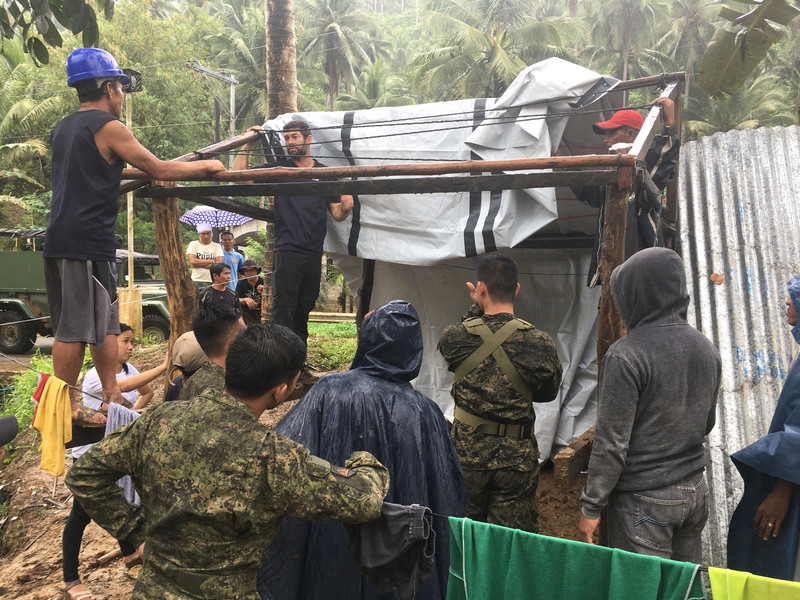 Our highly trained ShelterBox response teams then go the extra mile to find the people left most vulnerable after a disaster – to make sure that no one gets forgotten or left behind. Our teams travel by foot, boat, helicopter or even tuk-tuk to get there. Whatever it takes. Our work isn’t done until we know that we’ve provided the right materials to help people transform their lives. Our ShelterBox response teams don’t just provide tools and tents or share skills. Our teams are the connection between ShelterBox’s supporters and people devastated by disaster – ordinary families helping other families thrown into extraordinary circumstances. We don’t just make quick decisions; we make good decisions. We work directly with local communities and partner with organisations to make sure that we get the right support to the right people. We also have a global network of ShelterBox affiliates and international partners. They share our belief in a world where no family is without shelter when disaster strikes, and support us in making this a reality. Their support comes in many forms, including fundraising, volunteering and help in getting our aid to exactly the right people. This collaboration happens at every stage of the journey. It enables us to transport emergency aid ad shelter across continents, bridge languages and take the path that leads straight to the families who need our support. Disasters happen every day. From conflicts and wars to volcanoes and tsunamis, we are ready to respond whenever we can. We are impatient to see a world where no family goes without shelter and we help as many families as we can. But we are a charity with limited resources and knowing where and when to help can be hard. Take a look at our ‘Decision to respond‘ criteria, which helps us decide which disasters and conflicts we will respond to. We are experts in shelter and we know that shelter means so much more than tents and tarpaulin. Shelter is a process of recovery that is owned and undertaken by families who have been affected by disasters and conflicts. 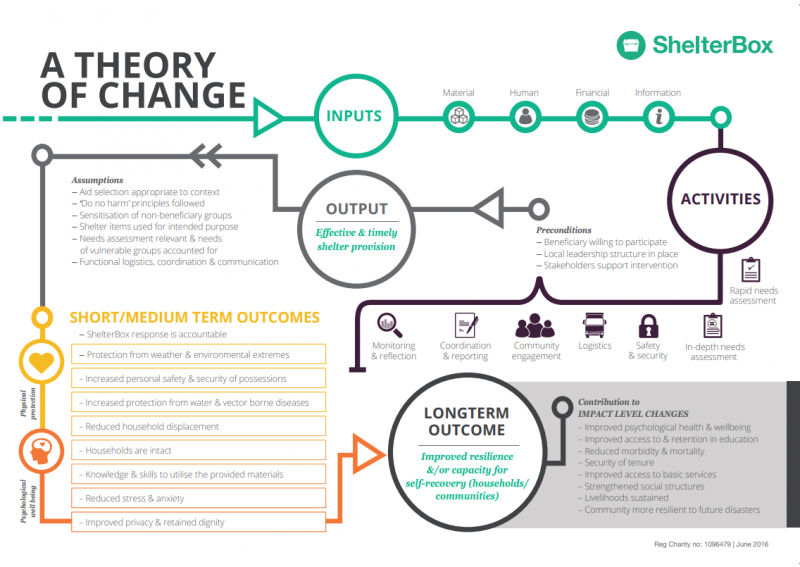 ShelterBox’s operational Theory of Change provides a powerful lens for us to ask ourselves simple but important questions about what we are doing and why. It informs our intervention planning and implementation, building on our 18 years of experience providing shelter in a range of disaster and humanitarian contexts around the world. Sign up with your email to receive the latest news and updates from ShelterBox Australia.